In the past year I have had the opportunity to travel to three different countries in Asia to check out the craft beer scene. Leading the pack is China, with many craft breweries in Beijing, Shanghai and other cities throughout the country. In Taiwan the craft beer scene is starting to take off with a few craft breweries in and around Taipei producing a great line-up of top notch beers. 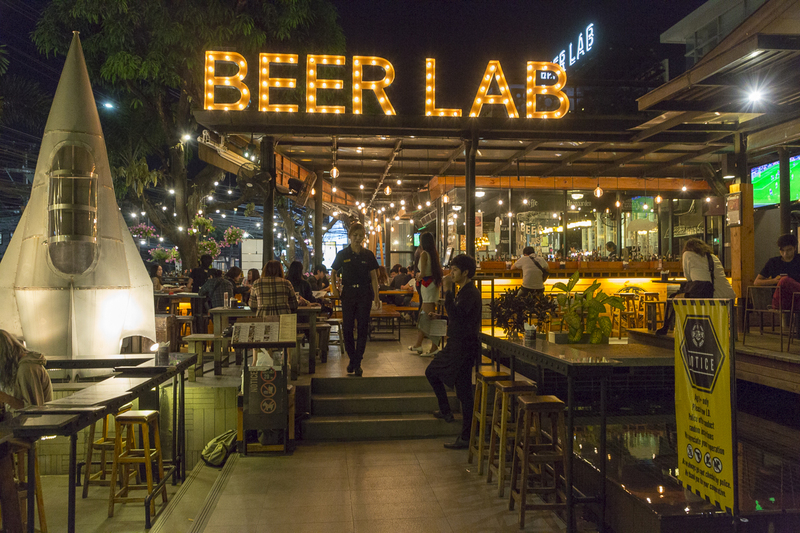 My most recent trip was to Thailand, where I was curious to see if the craft beer revolution has swept into the land of “smiling people”(Siam). Well, as I found out during my 19 day tour, somethings are not black and white in the land of sun and fun. The news is not all dark, otherwise the story would end here. As we have seen in our own environment – if there is a will – there is a way. History seems to repeat itself when it comes to craft beer world wide – the permits and permissions/making/serving and marketing of product are all very complicated. In B.C we had the heavy cloak of the Prohibition Years (1917 – 1921) and the aftermath the muscle of the industrial breweries. That made provincial government sluggish, with rules and regulations building walls quicker than they could be taken down. A fact of life for decades. As we have learned, things can change once government bodies realize that the general populace are fed up with draconian rules. We are not alone… I have traveled to many places in recent years where this struggle is still playing out – where the suspicion is that the mega breweries control the regulations that the governments push at the entrepreneurs and consumers of craft beer worldwide. On this trip we are boarding at YVR for a 16 hour flight to Bangkok, Thailand. My first exposure to craft beer in Thailand was the Tawandang German Brewery which seems more like a cabaret, than a craft beer pub. Beers are served in sizes from 330ml, 500ml, 750ml and 3 litre Plexiglas Tower cylinders. There are three offerings – a lager, dunkel and a weisen beer. To be honest the beer is closer to the home brew I drank as a teenager in the dark dank pubescent basements of my friends homes in Nanaimo, than anything I would call craft of the west coast in the 21st century. This legal craft beer has to made in huge quantity – 100,000 litres/year. No bottling/no canning allowed – just onsite consumption. Of course you need a 1000 seat restaurant to fulfill that requirement. If a few hundred litres accidentally go down the drain – no real loss. 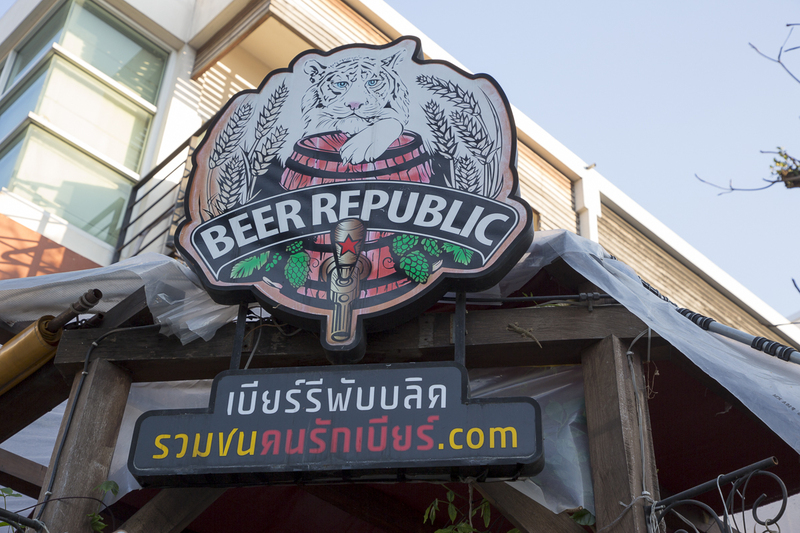 On my quest to find real craft beer I headed north to Chiang Mai. 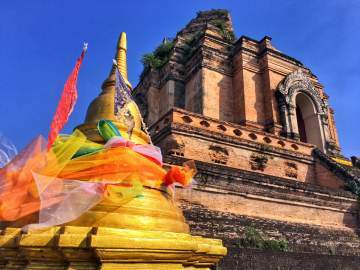 Only a one hour flight away from the hustle and bustle of Bangkok, the second largest city in Thailand is nestled in the picturesque north . On my first day I borrowed a bicycle from my hotel and went on a self guided tour within the walls of the old city. I highly recommend this as there are endless alleyways to explore crisscrossing past monuments and temples with boutique hostels with juice and coffee and light meals for sale. My first stop for craft beer was on the outside of the wall near my hotel. The Riverside Bar and Restaurant has been in operation for 33 years and prides itself on a 500+ menu and a selection of craft beers. GM Peter told me that three years ago they decided to start selling craft beer and they have never looked back. 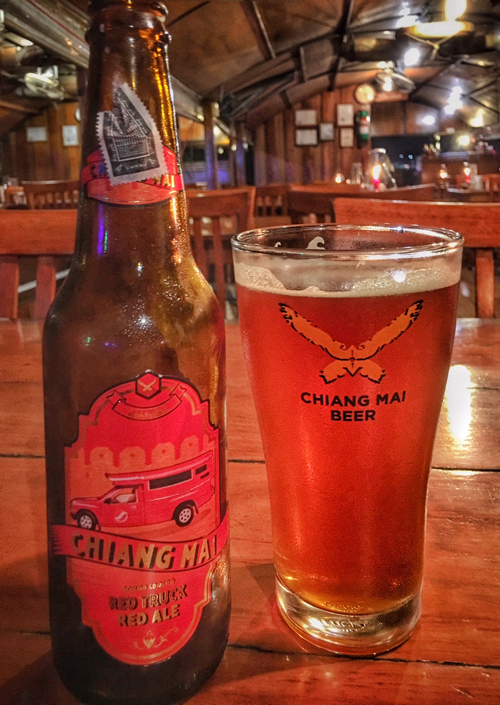 I sat with Peter for a flight of craft that included “Local” Chiang Mai Brewing Red Truck Pils and Red Truck Ale. Also included where Deschutes Hazelnut Brown Ale and Stones Go To IPA. 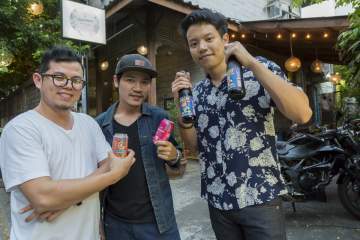 The CMB “local” beers are being produced in Cambodia and shipped to Thailand. The rest of the craft beers are from America. Peter uses a local beer broker named Beervana to supply his craft beer. We had a wonderful visit and I was invited back for a River Boat Dinner cruise. The deep fried TabTim fish and deep fried mushrooms in batter with garlic sauce are so amazing with the malty CMB Red Truck Ale. 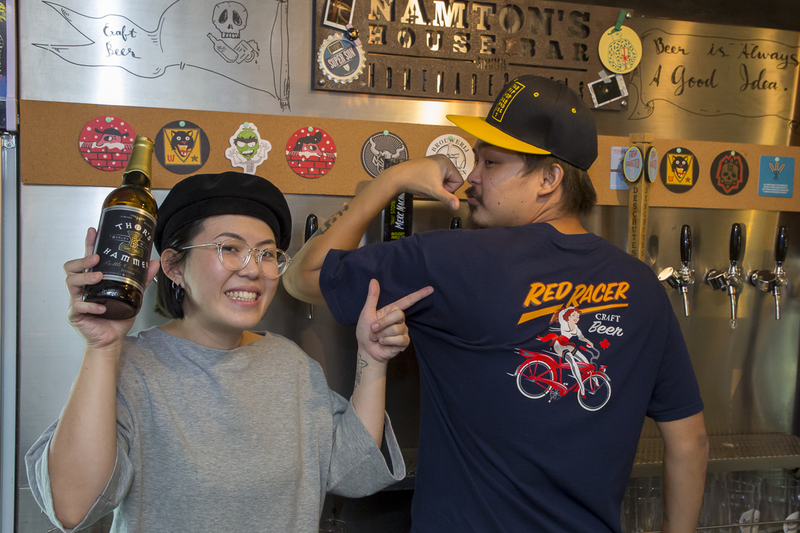 I got back on my bike with no brakes for a pedal two km down the road to visit Namtons House Bar. Here I met Em, Namtoms husband who is an avid brewer. Our first moments were to see the many varieties of hops he is growing. These include Willamet, Sterling, Cascade, Chinook and Liberty. I curious how he got the hops to Thailand – he could not comment on this. Inside the cozy house bar I met his smiling wife Nantom. The couples passion for beer is very evident by the number taps (12) and bottle/cans in their fridges. Em has a special fridge that is just for himself and those he likes to share with. By mid 2018 he hopes to expand to 20 taps. Em told me he has been arrested 3 times in the past 3 years for selling his own beer. The fines were around $500. He said if he gets arrested again it could be $25,000 and 6 months in jail. He does not seem to be perturb by this threat. I was very fortunate to try a number of rare beers from all over the world with the couple. Interestingly they had a empty bottle of Thor’s Hammer – and I just happen to be wearing a Central City t-shirt. Later in the evening we went to their new bar, Parallel Universe Of Lunar 2 On The Hidden Moon:Local Craft Beer Bar with 10 taps, including Ballast Point, Deschutes and Schneider Weisse. I enjoyed a Mein Adventinus Wheat Doppel Bock. There is also and a good selection of craft bottles/can beer. The 5th floor balcony view of jets ascending from the near-bye airport was breathe taking. On my last evening in Chang Mai I headed out to two more craft beer pubs. At Beer Republic I found craft from all over the world – the quality very good! Especially good was Brewdog Punk IPA (Scotland) and the Deschutes Fresh Squeezed IPA (Portland). 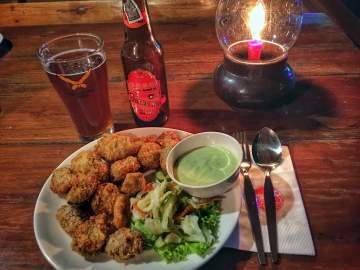 They were served in pint glasses for 330Baht ($13cdn) I also visited Beer Lab with the largest selection of draft craft beer in Northern Thailand. The next day I was back in Bangkok. My nineteen day trip was rapidly coming to a close. There were two more craft brew pubs I wanted to visit in the Big Mango. 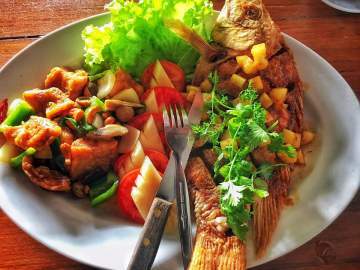 One of the most quaint was in an 80 year old house called Dok Kaew House Bar. This Brew Pub has the feeling of going to visit friend. Much to my surprise Off the Rail IPA was on tap and Parallel 49 was in the fridge. Who would expect to find an East Van craft beer in the middle of BKK? Damn, it’s hard enough to find in near-bye Fort Langley! 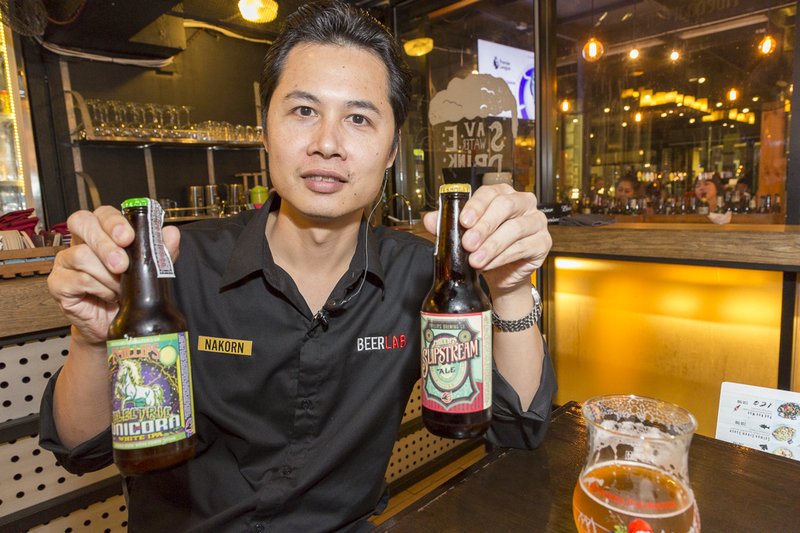 An extra bonus… yes.. like in Chiang Mai there were two craft beers made by the staff. I got to sit down with Supot “Pot” Onmark and Pope – two of the six partners that run the establishment. On tap were two illegal beers from one of the partners “Nectar Brewery”. I got to taste them both. I really enjoyed the Russian double (9%). Sometimes they will host a home brew night with 6 to 8 local craft beers. Another partner, Bamee stated about change in Thai craft beer scene “The big wave of Thai craft beer has been in the three years. There are now hundreds of Thai craft beer brands and more are coming soon. – things will change in a better way.” All partners share in pouring – so you are guaranteed to meet at least two at any one time. Along with my beer I had a tasty bowl of Leng – a sour and spicy pork rib soup. Next, I made a dash to Hair of the Dog in the centre of Bangkok. 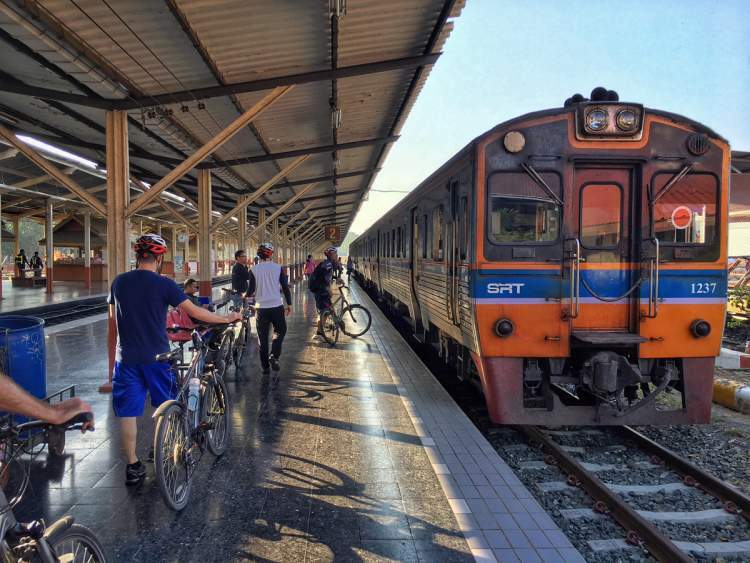 They have two locations – both are very convenient to get to by BST (Bangkok Skytrain). The interior decor is a very interesting concept – a combination of OR/medical lab and morgue. I was told by one of the partners that it is unlikely any one will try to create a knockoff bar to compete with them! I would agree. Here you will find 330ml glasses of premium craft for 340baht ($13.50cad). It is pricey, but the owner, Pete Spalding stated that where else can you find these beers in Asia? 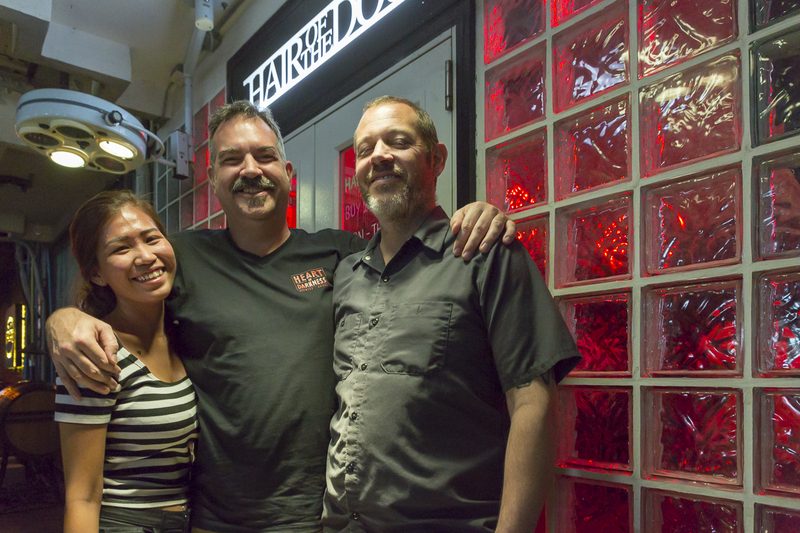 While I was there I had the pleasure to meet Brian Bartusch from Beervana (largest craft importer in Thailand) and John Pemberton (brew master) from Heart of Darkness Brewery, Saigon. Brian told me that there are over 1000 serious craft brewers in Thailand. Beervana supplies over 500 craft beer pubs with their imported products. Mostly they focus on West Coast USA beers, such as Stones, Rogue and Deschutes. 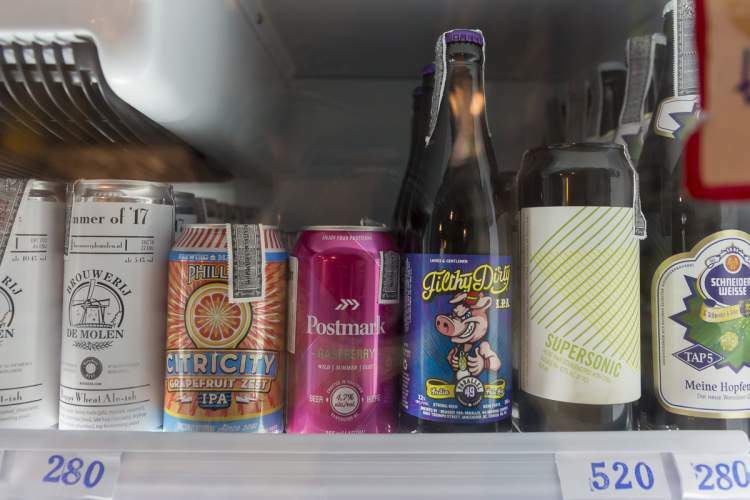 Brian said the larger industrial breweries, such as Chang and Singh are trying to buy out illegal brands that are very popular underground and mass produce them. 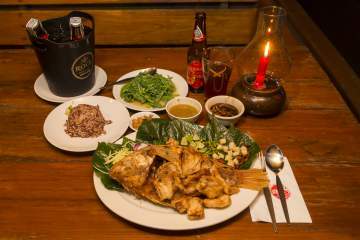 John mention that Saigon has had 16 craft breweries open in the three years. Sound like a beer lovers nirvana! 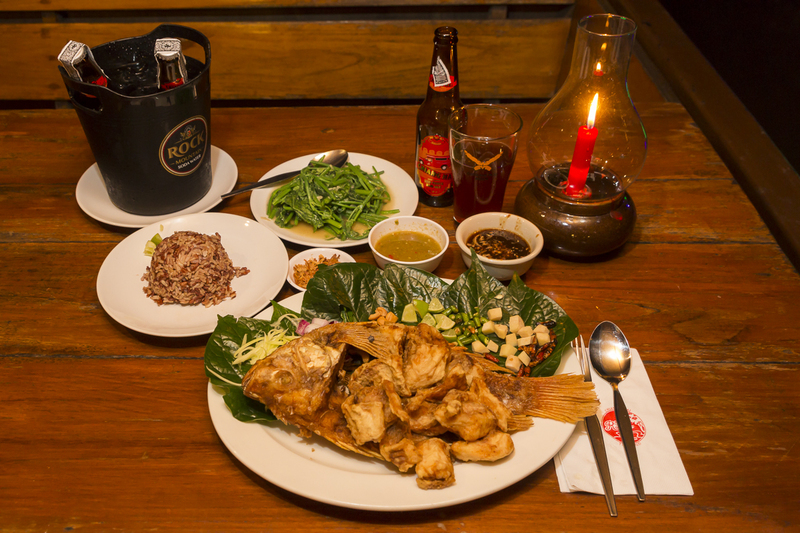 If Johns beers are any indication of craft beer in Vietnam – I’m booking a ticket there soon! If you go out exploring the craft beer market in Thailand’s central and northern regions you will find craft beer – very good quality craft beer. You will also find those beer frontiersmen that are willing to break the law to bring local craft beer to your glass. For that reason alone, it is worth the adventure to witness the beginning of a new age in Thailand. Not for those with a budget wallet, but it can be balanced the inexpensive other parts of daily living in Thailand make the splurge for a craft tolerable. Brian K. Smith, MPA is an accredited member of the BC Association of Travel Writers. 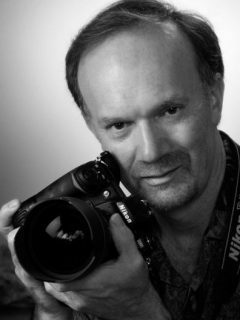 He is a member of Professional Photographers of Canada with a Master of Photographic Arts designation. Brian writes the Have Camera, Will Travel column and is Chief Photographer for What's Brewing.